Linden-hornbeam oak forests in Grabove ravine can be regarded as the easternmost outpost of the massive distribution of the hornbeam in Ukraine. The material for this paper was collected in Belenschina Village (Piatikhatskyi District, Dnepropetrovsk Region) since May to June 2009 using pitfall traps. Glass jars of 0,5 liter volume containing 2 % formalin served as pitfall traps. There are 524 trap-days were spent and 402 specimens were collected. A total 18 spider species from 9 families are recorded. This result does not reflect the actual species richness in Grabove ravine. There is a need to take further research to complete the spider species list. Maximal species richness and abundance characterize families Lycosidae (5 species, 84,1 % specimens) and Thomisidae (3 species, 7,3 % specimens). The largest number of spider species was recorded in the lower third of the southern slope (11 species), the largest value of dynamic density was in the middle third of the southern slope (154,4 specimens/100 trap-days). The minimal species richness (5 species) was found in the middle third of the northern slope. The lowest values of dynamic density were recorded in the lower third of the northern slope (39,4 specimens/100 trap-days). Arnoldi, К. V. (1956). An outline of entomofauna and characteristics of entomocomplexes of forest litter in the region of Derkul. Trudy Instituta lesa, 30, 279-342 (in Russian). Belgard, А. L. (1971). Steppe forestry. M.: Lesnaya promyshlennost (in Russian). Evtushenko, K. V. (1993). [To the study of spiders (Aranei) of the Novgorod-Severskoe Polesye.]. Red. zh. Vestnik Zoologii. Kiev. Dep. VINITI 06.01.93. No.26-B93. (in Russian). Gilyarov, M. S. (1953). Soil fauna of bairak forests and its significance for soil diagnostics. Zoologicheskiy zhurnal, 32(3), 328-347. Hammer, Ø. PAST. (1999-2018). Paleontological statistics. Version 3.19. Reference manual, 259. Available from: https://folk.uio.no/ohammer/past/past3manual.pdf. Accessed 13 March 2018. Hammer, Ø., Harper, D. A. T., Ryan P. D. (2001). PAST: Paleontological statistics software package for education and data analysis. Palaeontologia Electronica, 4(1), 9. Kunakh, О. N., Zhukov, A. V., Prokopenko, Е. V., & Balyk, Yu. А. (2008). Ecological structure of the animal population of the Yatsev Yar Ravine. Bulletin of Dnepropetrovsk University. Biology. Ecology, 16(2), 74-85 (in Russian). Polchaninova, N. Yu., & Prokopenko, E. V. (2013). Catalogue of the spiders (Arachnida, Aranei) of Left-Bank Ukraine. Arthropoda Selecta, Supplement N0.2. M.: KMK Scientific Press Ltd., 1-268. Polchaninova, N. Yu., & Prokopenko, E. V. (2017). Catalogue of the spiders (Arachnida, Aranei) of Left-Bank Ukraine. Addendum 1. 2013 – 2016. Arthropoda Selecta, Supplement N0.4. M.: KMK Scientific Press Ltd., 1-115. Prokopenko, Е. V. (2003). Population structure of spiders (Aranei) of the tree plantations in Donetsk. Vestnik zoologii, Supplement 16, 108-110 (in Russian). Prokopenko, О. V., Kunakh, О. М., Zhukov, О. V., & Pakhomov, О. E. (2010). Biological diversity of Ukraine. Dnipropetrovsk region. Spiders (Aranei). Dnipropetrovsk: Izdatelstvo of Dnipropetrovsk National University (in Ukrainian). Prokopenko, Е. V., Pakhomov, A. E. Kunakh, О. N., & Zhukov, A. V. (2009). Ecological structure of the spider community (Araneae) in Voiskovaya Ravine Bulletin of Dnepropetrovsk University. Biology. Ecology, 1(17), 183-192 (in Russian). Prokopenko, Е. V., & Zhukov, A. V. (2009). Structure of spider population (Araneae) of the bairak forests of Dnipropetrovsk Region. Problems of ecology and nature protection of the technogenic region. Donetsk: DonNU, 9, 124-130 (in Russian). Prokopenko, Е. V., & Zhukov, A. V. (2011). The population structure of spiders (Aranei) of the bayrak katena. Bulletin of Donetsk University. Ser. A. Natural sciences, 2, 145-150 (in Russian). Prokopenko, Е. V., & Zhukov, A. V. (2018). Spider (Aranei) steppe community in a ravine with fescue-feather-grass petrophytic vegetation. 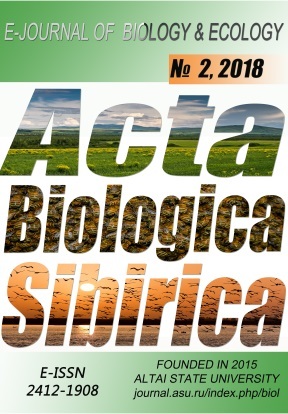 Acta Biologica Sibirica, 4(1), 17-21 (in Russian). Zhukov, A. V., Kunakh, О. N., Prokopenko, Е. V., & Balyk, Yu. А. (2008). Ecological diversity and organization of the animal population of Yatsev Yar Ravine. Bulletin of Dnepropetrovsk University. Biology. Ecology, 16(2), 51-59 (in Russian).